Our region is growing quickly, and we must continue the work underway to ensure that people can get to where they need to go, today and in the future. The 2041 Regional Transportation Plan – the 2041 RTP - is about providing even more people with access to fast, frequent and reliable transit, and making it easier for travellers to use transit, or travel by bike or on foot. 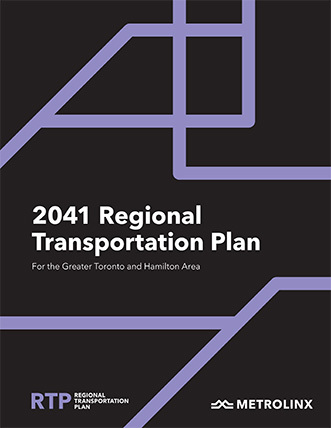 The 2041 RTP guides the continuing transformation of the transportation system in the Greater Toronto and Hamilton Area (GTHA). It is the blueprint for an integrated multimodal regional transportation system that puts the traveller’s needs first. Everyone has a role to play in making the transportation system work. Making the 2041 RTP a reality is only possible through collaboration and partnership, and all those who plan, build, maintain, finance and/or operate transportation in the GTHA need to be involved. This includes the 30 regional and local governments in the GTHA, Metrolinx, the Province of Ontario, the federal government, and the transit agencies (including the GO Transit division of Metrolinx). It also means working with municipalities and the private sector to ensure that land uses – such as for housing, offices, condos, hospitals, school campuses and recreational facilities – are designed to focus on the movement of people, not just vehicles. the business community to support the delivery of goods while reducing emissions and conflict with other road users. Full implementation of the 2041 RTP will lead to an integrated and seamless transportation system for the GTHA. It will improve the traveller experience and offer enhanced transportation choices. It will improve access to reliable and frequent rapid transit, and will make travel more affordable by reducing the need to own a car—and will thereby provide associated social, environmental, health and economic benefits. If you require this document in an alternate format, please visit the Accessible Formats page on our website for more information. 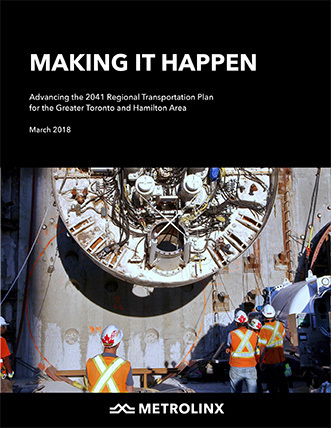 Whereas the 2041 RTP outlines a vision for our transportation system for the next 25 years, the “Making it Happen” paper is about how we get there. The “Making it Happen” paper launches the discussion on what we, as a region, can do to make the regional transportation system presented in the 2041 RTP a reality. The work of building an integrated transportation system for the GTHA is underway. Our collective success depends on us making progress in how we make decisions, fund transportation, set priorities and monitor our progress. Implementing the 2041 RTP is a shared responsibility that requires the participation of all municipal partners. Making the 2041 RTP a reality will also require the involvement of the private sector, civic organizations, universities and colleges, the travelling public, and many others.